Fans of two of some of the world’s biggest movie franchises – Game of Thrones and Fast and Furious – are bound to hear the name Nathalie Emmanuel and jump with excitement. Nathalie Emmanuel, still in the early days of her acting career, has secured a place in the hearts of millions through her performances and beauty. It is her excellence that has defined her career till date along with her iconic afro hair which has made her recognizable, even beyond the natural allure of being a film and television star. The English Film and Television industry has a young star on their hands and fans of the industry can be rest assured that for years to come, Nathalie Emmanuel would grace their screens. Learn more about her by reading below. Nathalie Emmanuel was born in South-on-Sea in Essex, England on the 2nd of March, 1989. She was born to a half Saint Lucian, Half English father and half Dominican half English mother, which means the actress is of mixed ethnicity. Growing up, Nathalie attended St Hilda’s School and Westcliff High School for Girls. As a child, her passion for the arts began to manifest. Her ability to constantly create drama in her household and neighborhood at a young age caused her insightful mother to put her in acting and dancing classes in order for her to channel her energy to something a little more productive. It turned out to be a smart move on her mother’s part as she starred in a West End production of the famous musical, The Lion King at the age of 10. At the time, she played the character, Young Nala. Seven years after that incredible achievement on West End, Nathalie Emmanuel made her onscreen debut on the show, Hollyoaks, playing the character, Sasha Valentine. She starred on the show for 191 episodes, and some of her character’s plot involved some of the most matured characterizations an actress could play onscreen, such as prostitution and heroin addiction. Nathalie was dropped in the deep end for her debut onscreen appearance. While she starred on the show, she starred in two of the shows spin-offs – Hollyoaks Later and Hollyoaks: The Morning After the Night Before, reprising her role. After the original show ended in 2010, Nathalie Emmanuel was plagued with one of the biggest problems an actor would face after playing a character for a long while, finding a new one. She did not, however, have to search for long as she was cast a guest star on shows, Casualty and Misfits, before she got a presenter role on a BBC Three’s show, Websex: What’s the Harm? It was a steady introduction back to multiple roles that led her to star in her first feature-length film, Twenty8k, playing the character, Carla. Since she made her big screen debut, Nathalie as then gone on to star in several movies, starring in mostly franchises – the Fast and Furious franchise, beginning with Furious 7 and the Maze Runner trilogy, starting with Maze Runner: The Scorch Trials. She then starred in a 2018 film, The Titan, playing the character W.D Tally Rutherford. While the Fast and Furious franchise is certainly a big role in its own right, especially in terms of the commercial revenue, her return to television in 2013 through Game of Thrones has been her biggest role yet. 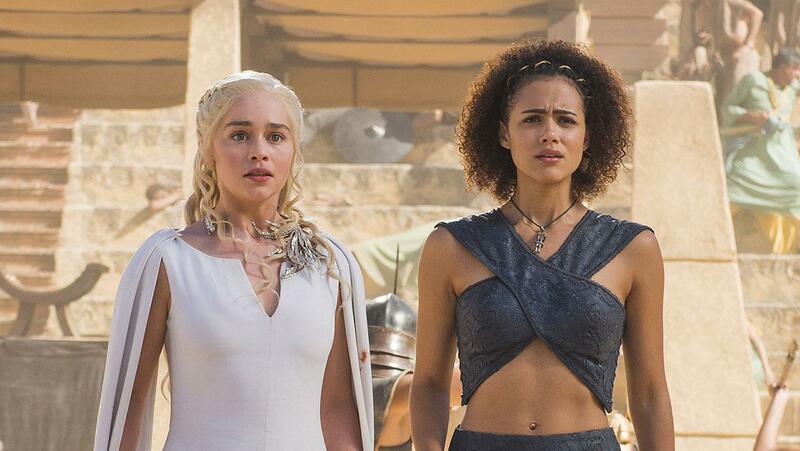 Working alongside fellow English actors on the show, particularly Emilia Clarke, she has played the role of Missandei and has become one of the most adored characters on the extremely popular show. Other television appearances include Four Weddings and a Funeral and The Dark Crystal: Age of Resistance, both in 2019. While everyone knows her onscreen boyfriend on Game of Thrones, her real-life relationships have been shrouded in mystery. Other than the previous knowledge of dating her Hollyoaks co-star, Sonny Valentine, details about her relationships are unknown. However, while we cannot say definitively if she is single or dating, we know that she is currently not married. Nathalie Emmanuel, for now, is a growing actress despite starring in some of the most commercially successful projects in recent history. However, her resume with credits from those films and shows give her chance at an increased earning power in the near future. For now, she is worth $1 million. 1. She was a shop assistant when she was cast as Missandei. 2. She won the Screen Nation award for Best Female Performance in Film for Furious 7. 3. She was named 99th sexiest women on earth in 2013 and 75th in 2015 by Instyle and GQ magazines. 4. She is a Vegan, citing health reasons for her dietary choices. 5. She won the Screen Nation award for Best Female Performance in Film for her role in Furious 7.